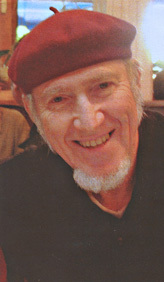 Herb Greene was born in Oneonta, New York in 1929 and arrived in Oklahoma to study at OU with Bruce Goff. The two men shared unconventional approaches to thought and design that culminated in some of the most jaw dropping organic structures ever built, so it’s not surprising that student and professor became lifelong friends. Over the years, Herb drafted several of Goff’s designs, even when he was busy working on projects of his own. After graduating from OU in 1954, Herb moved to Houston to work for Joseph Krakower’s firm and designed several homes and a few commercial buildings there. After Goff left OU, Herb returned to Norman as an associate professor to help keep his mentor’s legacy alive. During this stint in Oklahoma, Herb also designed some of the state’s most interesting homes and commercial buildings, which brought quite a bit of press to the Sooner State. Herb left Oklahoma for good in 1963 when he accepted a teaching position at the University of Kentucky, where he remained until he retired 18 years later. Herb has spent his retirement in California busily writing books, travelling, and painting. After his stint in Houston, Herb worked on his own.